GM foods are contributing to the rise of autism, obesity, diabetes, asthma, cancer, heart disease, allergies, reproductive problems, and many other common health problem now plaguing Americans. In the first nine years after the large scale introduction of GMO crops in 1996, the incidence of people with three or more chronic diseases nearly doubled, from 7% to 13%. Animals are dying in large numbers from GMO's. In India, animals graze on cotton plants after harvest. But when shepherds let sheep graze on GMO cotton plants, thousands died. Post mortems showed severe irritation and black patches in both intestines and liver (as well as enlarged bile ducts). Investigators said preliminary evidence “strongly suggests that the sheep mortality was due to a toxin. Most probably GMO-toxin.” In a small follow-up feeding study by the Deccan Development Society, all sheep fed GMO cotton plants died within 30 days; those that grazed on natural cotton plants remained healthy. In another village in India, buffalo grazed on cotton plants for eight years without incident. Then the buffalo were allowed to graze on GMO cotton plants for the first time. All 13 were sick the next day; all died within 3 days. GMO corn was also implicated in the deaths of cows in Germany, and horses, water buffaloes, and chickens in The Philippines. In lab studies, twice the number of chickens fed GMO corn died; 7 of 20 rats fed a GM tomato developed bleeding stomachs; another 7 of 40 died within two weeks. Monsanto’s own study showed evidence of poisoning in major organs of rats fed Bt corn, according to top French toxicologist G. E. Seralini. The only published human feeding study revealed what may be the most dangerous problem from GM foods. The gene inserted into GM food transfers into the DNA of bacteria living inside our intestines and continues to function. This means that long after we stop eating GMOs, we may still have potentially harmful GM proteins produced continuously inside of us. Put more plainly, eating a corn chip produced from GMO corn might transform our intestinal bacteria into living pesticide factories, possibly for the rest of our lives. Scientists at the Food and Drug Administration (FDA) had warned about all the dangers of GMO's back in the early 1990s. According to documents released from a lawsuit, the scientific consensus at the agency was that GM foods were inherently dangerous, and might create hard-to-detect allergies, poisons, gene transfer to gut bacteria, new diseases, and nutritional problems. They urged their superiors to require rigorous long-term tests. But the White House had ordered the agency to promote biotechnology and the FDA responded by recruiting Michael Taylor, Monsanto’s former attorney, to head up the formation of GMO policy. That policy, which is in effect today, denies knowledge of scientists’ concerns and declares that no safety studies on GMOs are required. 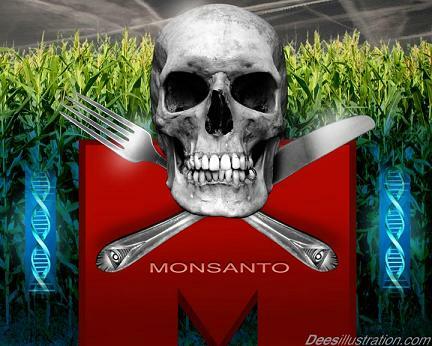 It is up to Monsanto and the other biotech companies to determine if their foods are safe. Mr. Taylor later became Monsanto’s vice president. Three GMO crops account for the vast majority of acres planted to GMOs around the world – corn, soybeans, and cotton. Five countries produce 90% of the world’s genetically engineered crops: Argentina, Brazil, Canada, India and the United States. While the animals themselves are not genetically engineered, the majority of the livestock Americans consume have been raised on genetically engineered grains. This is because the two most prevalent genetically engineered crops are corn and soy which are used in many processed foods and most animal feeds. A genetically engineered salmon is pending FDA approval. The GE Atlantic salmon being considered was developed by artificially combining growth hormone genes from an eelpout. This modification causes production of growth-hormone year-round, creating a fish that grows at twice the normal rate. If approved, it will be the first genetically engineered animal on supermarket shelves in the U.S. The world's leading soy producers predominantly grow genetically modified soy cultivars. Soy is not only the basis for numerous ingredients and additives, it also makes up a major part of poultry, swine, and cattle feed. All made from starch. Converting starch to sugar is one of the most economically important areas of biotechnology. It is a central process in the production of countless foods. Enzymes are responsible for the breakdown of starch, the vast majority of which are produced by genetically modified microorganisms. Genetic engineering has opened the door to turning our food into deadly poison. Labeling GMO food is only the beginning. It's time we demand that GMO crops be eliminated, and any food containing GMO ingredients be banned from the food supply.